There was a time when railroad business often was communicated by telegraph. Before the 1950s most clerks, agents and operators needed to be conversant in Morse Code. Sending and receiving code didn’t always come easily and required a great deal of effort to learn. Letters and numbers were represented by a series of dots and dashes. An accomplished telegrapher could not only hear the code for individual letters, but recognize whole words as the telegraph sounder was clicking away. This led to an increase in speed and efficiency. The very best telegraphers could type the message on a typewriter as the sounds were received. Much of the telegraph traffic was routine business such as arranging for a rail shipment as in the telegram above. Accuracy of the message was always important. The telegraphers were under pressure to limit mistakes. It required both the sender and receiver to do his or her job well. When it came to dispatching trains the message must be completely accurate to prevent a life threating accident. The American Strawboard Co., mentioned in the telegram above, had a factory in Circleville that processed straw into a multi-use product used as insulation, packing materials, containers and even corrugated boxes. The above telegram arranges for the shipment of a box car and states the shopping rate - 61 cents per 100 lb. The hole in the telegram was caused by a spindle, a pointed medal spike the telegram would be impaled upon when the clerk was finished processing the order. When companies converted to IBM cards the information was encoded on the card with punched holes. People had to be warned "Do Not Fold, Spindle, or Mutilate" the card. 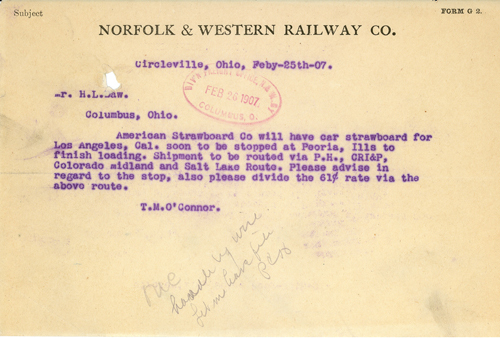 The selects on the left lead to a sample of Norfolk & Western Railroad telegrams from 1900-1910. Handling telegrams was all in a day’s work for an experienced 1900 era railroader.